"Muhtar Pasha" redirects here. For his son, see Mahmud Muhtar Pasha. For other people named Ahmad Pasha, see Ahmad Pasha (disambiguation). 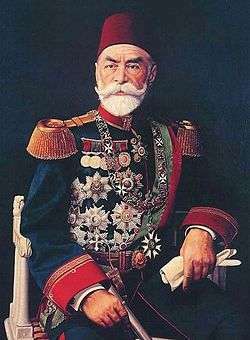 Ahmed Mukhtar Pasha (Ottoman Turkish: احمد مختار پاشا‎;‎ 1 November 1839 – 21 January 1919) was an Ottoman field marshal and Grand Vizier. Ahmed Muhtar was born on 1 November 1839 to a Turkish family in Bursa in the Ottoman Empire and was educated in the Ottoman Military College in Constantinople (modern Istanbul). He eventually became professor and then governor of the school. In 1856, he served as an adjutant during the Crimean War. In 1862, he was a staff officer in the disastrous Montenegrin campaign. Between 1870 and 1871, he quelled rebellions in Yemen. He gained the titles of Pasha and Marshal and, in 1873, was made commander of the Second Army Corps, holding the position until 1876. During the 1875 uprisings in Bosnia and Herzegovina, he assumed control of the Turkish forces there. On the outbreak of the Russo-Turkish War, 1877-1878, he was sent to take charge of operations in Erzurum. Although the Russians ultimately defeated the Ottomans in the war, Muhtar's victories against them in the eastern front won him the title Gazi ("Victorious"). In 1879, Ahmed Muhtar Pasha was appointed the commander of the Ottoman Empire's frontier with Greece, before being sent in 1885 to serve as the Ottoman High Commissioner in Egypt. Ahmed Muhtar Pasha was appointed as Grand Vizier in July 1912 at age 72, largely due to his prestige as an old military hero. His premiership was a result of the Savior Officers (Turkish: Halâskâr Zâbitân) forcing the dissolution of the previous Committee of Union and Progress (CUP) government under Grand Vizier Mehmed Said Pasha. The Savior Officers were partisans of the opposition Freedom and Accord Party (also known as the Liberal Union or Entente) who felt cheated after the infamous 1912 elections, known as the "Election of Clubs" (Turkish: Sopalı Seçimler), in which the CUP had employed electoral fraud and violence to gain 269 of the 275 seats in the Chamber of Deputies (Turkish: Meclis-i Mebusan, the popularly-elected lower house of the national General Assembly) while leaving only 6 to the opposition. The non-party, independent cabinet formed by Ahmed Muhtar Pasha was known as the "Great Cabinet" (Turkish: Büyuk Kabine) because it included three former Grand Viziers as ministers and sometimes as the "Father-Son Cabinet" (Turkish: Baba-Oğul Kabinesi) because it included Ahmed Muhtar Pasha's son, Mahmud Muhtar Pasha, as Minister of the Navy. Because the Great Cabinet did not include any members of the CUP, rumors began to spread that the government would dissolve the Chamber of Deputies, which was dominated by CUP after the fraudulent 1912 elections. A few days after Ahmed Muhtar Pasha took office, the Savior Officers sent a letter of threat to the President of the Chamber of Deputies (and CUP member), Halil Bey, demanding that the Chamber be dissolved for new elections within 48 hours. The CUP members in the Chamber condemned and censured this threat. However, thanks to a law he had passed through the Senate, Ahmed Muhtar Pasha was able, with the sultan's support, to dissolve the Chamber with ease on 5 August. After the dissolution of the Chamber, the First Balkan War erupted early in October 1912, catching Ahmed Muhtar Pasha's administration off-guard. Martial law was declared, and Ahmed Muhtar Pasha resigned as Grand Vizier on 29 October after just four months in the premier's office. Ahmed Muhtar Pasha died in Istanbul on 21 January 1919 at the age of 79. His son Mahmud Muhtar Pasha was also a high-ranking commander in the Ottoman Army and the Minister of the Navy in Ahmed Muhtar Pasha's own government. ↑ Lewis, Bernard (1961). The Emergence of Modern Turkey. Ankara. ↑ Dumont 1997, p. 56. ↑ Kuran 1945, p. 284. ↑ Arar, İsmail (1986). Osmanlı Mebusan Meclisi Reisi Halil Menteşe'nin Anıları [Memoirs of Halil Menteşe, President of the Chamber of Deputies] (in Turkish). Hürriyet Vakfı Yayınları. p. 160. ↑ "Meclis-i Mebusan Zabıt Ceridesi - Kırkyedinci İnikad" (PDF) (in Turkish). Chamber of Deputies (Ottoman Empire): Grand National Assembly of Turkey. Retrieved 7 April 2013. Dumont, Paul; Georgeon, Gregoire François; Tanilli, Server (1997). Bir İmparatorluğun Ölümü: 1908–1923 (in Turkish). Istanbul: Cumhuriyet Yayınları. Retrieved 27 July 2014. Kuran, Ahmed Bedevî (1945). İnkılâp Tarihimiz ve Jön Türkler. Tan Matbaası.